Cultural crossovers in food is fun to me. You know, when a common dish in one culture is transformed or twisted slightly to incorporate flavors of another culture? 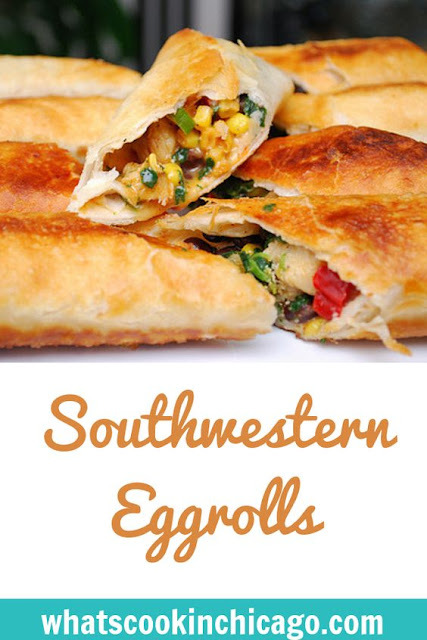 Take for example these Southwestern Eggrolls I made for my birthday fiesta... All the great flavors of Tex Mex cuisine served up with Chinese eggroll flair! These were a great appetizer for my Cinco de Mayo inspired menu so if you're looking for something to make to celebrate tomorrow, give these a try! I think these being referred to as 'eggrolls' is a bit of a stretch. In fact, to me they're more like mini chimichangas. Whatever you're comfortable calling them, they are pretty easy to make and allow for some creativity too. 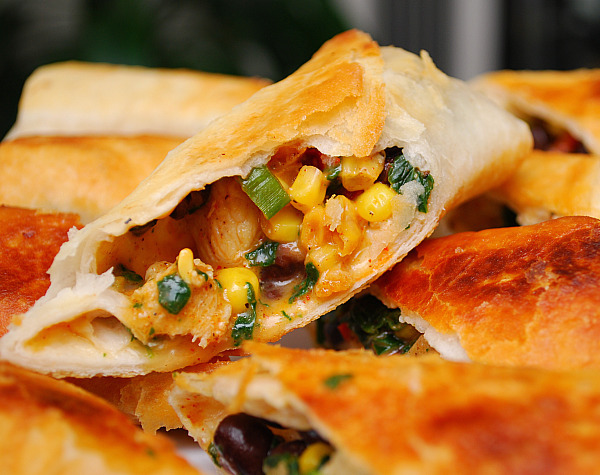 These Southwestern Eggrolls involve making a colorful and tasty filling of diced chicken breast, spinach, black beans, sweet corn, garlic, bell peppers, green onion, jalapenos, seasonings and cheese. 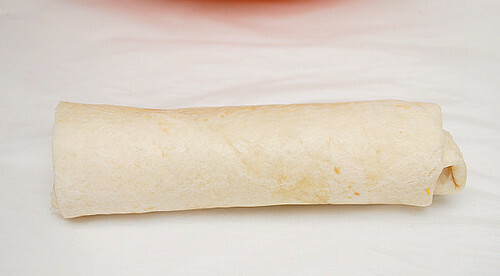 This filling is then rolled up into a flour tortilla, frozen to keep it's shape and then fried to a golden brown. The creativity comes into play when you experiment with other filling ingredients you might prefer. Add as much or as little as you'd like of the ingredients listed... or feel free to throw in something else. Do you like it spicier? Add some more hot peppers! Are you a mushroom lover? Add those in too! To me, whatever you feel like filling it with is all up to you. This recipe serves as a great base to start but don't be afraid to experiment... that's part of the fun in cooking. Just note that these eggrolls are best made a day before so they have time to freeze up before frying. Orale mis amigos! *To keep warm, placed browned eggrolls on a baking sheet in a 200 degree oven until ready to serve. 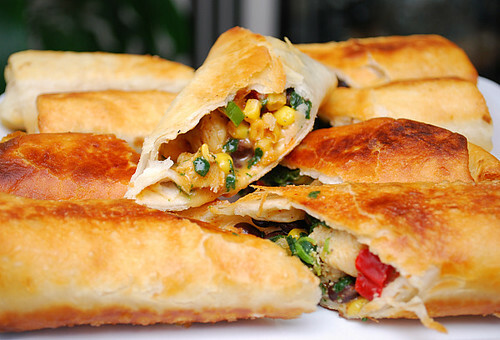 Egg rolls, chimichangas - whatever you call them - they look fabulous to me! Yum! These look so good and full of flavor! yum! i love southwestern eggrolls! so tasty! Do these HAVE to be deep fried? Could they be cooked in a flat plate sandwich maker? I am thinking of the way Lebanese doner kebabs are toasted in a sandwich press. 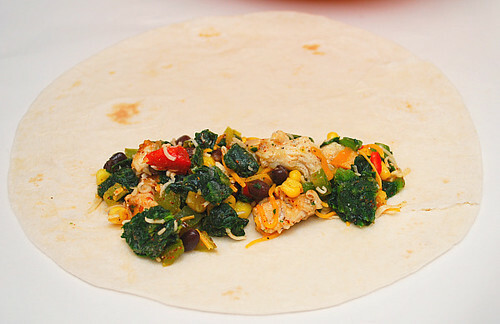 Anonymous 1 - you can definitely omit chicken and just increase the amount of veggies for a vegetarian option. Anonymous 2 - I've only deep fried and baked them. I prefer the texture of the deep friend version (which is what I posted). I didn't even think of cooking them in a flat plate sandwich maker/press but I would assume it would work since it would be like a pressed wrap sandwich. If you decide to try it, please let me know! Those look so wonderful, I have added the ingredients I need to my grocery list. Thank you so very much for sharing. Joelen, what temp and time did you bake these for? I'd prefer to do that instead of frying. Thanks! Marianna, when I've baked then, I brushed them with a little oil (or spray oil) and baked in a 375 degree oven for about 20-25 minutes until browned. I definitely made more filling that the recipe called for + so glad I did. These things are fantastic + I'm eating them every day for lunch this week! These are amazing. I made them on Thursday and was asked to make them again tonight. I will be doubling maybe tripling this recipe to freeze extra.